I remember first seeing an image of this in E. H. Gombrich’s Story of Art, which was my bible while studying Art History at college. 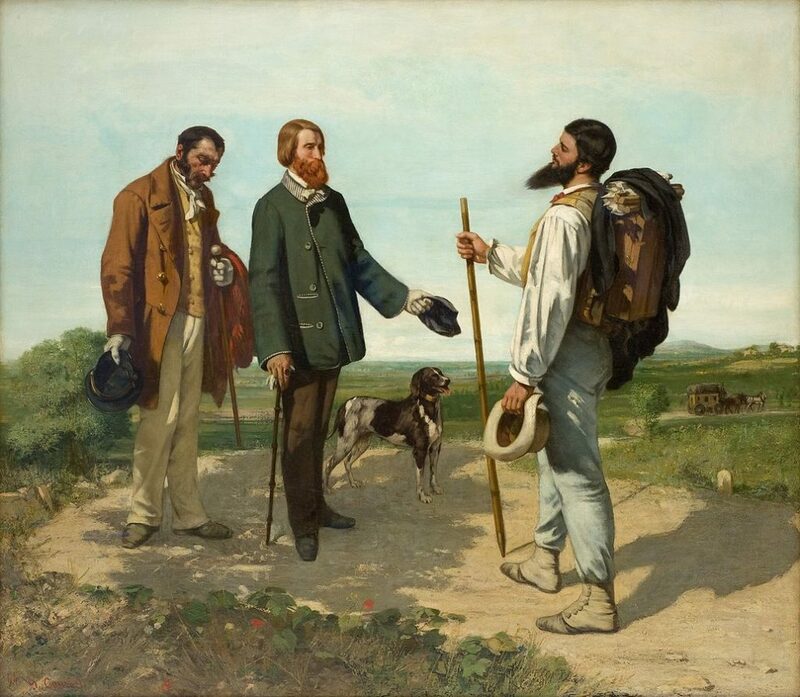 I found the painting intriguing and appealing without really thinking about why, and I didn’t quite see how Courbet fitted into an otherwise neat chronology that the author had compiled. He was obviously doing something different to everyone else, breaking with what he saw as the outmoded and restrictive norms of the time, which I guess is part of its charm. Courbet was seen as an avant garde artist, very much doing his own thing regardless of how it would be received. In the same year he painted this work he wrote “I hope always to earn my living by my art without having ever deviated by even a hair’s breadth from my principles, without having lied to my conscience for a single moment, without painting even as much as can be covered by a hand only to please anyone or sell more easily.” I think that defiance and conviction comes across in his work. The fact that he has depicted himself dressed down in white shirtsleeves (something no self-respecting artist would do) was shocking to the audience when first exhibited in 1855. Courbet has not paid homage to the rules of Academic art in terms of theme, composition, colour or beauty. He is going his own way, and there are those (including Bruyas) who recognise his genius for doing so. Courbet was one of the first truly modern artists. He pioneered what was then a revolutionary thought that we take for granted: that personal expression and individuality was the very purpose of being an artist, and that it was more important than tradition.